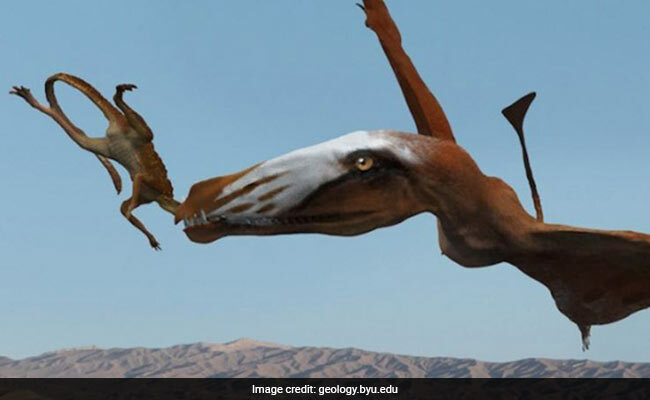 200 Million-Year-Old Pterosaur "Built For Flying"
The newly discovered member of the family, identified through remains found in northeastern Utah, had a wing-span of 1.5 metres (five feet) and 112 teeth, including fang-like spikes sticking out near the snout. Scientists on Monday unveiled a previously unknown species of giant pterosaur, the first creatures with a backbone to fly under their own power. Neither dino nor bird, pterosaurs -- more commonly known as pterodactyls -- emerged during the late Triassic period more than 200 million years ago and lorded over primeval skies until a massive space rock slammed into Earth, wiping out the dinosaurs and most other forms of life some 65 million years ago. "They are delicately framed animals that are built for flying," said Brooks Britt, a paleontologist at Brigham Young University in Utah and lead author of a study in Nature Ecology & Evolution. Caelestiventus hanseni -- roughly, "heavenly wind" -- is probably the most complete skeletal remains of a pterosaur ever found. "Most pterosaurs bones look like road-kill," Britt told AFP, noting that there are only 30-odd specimens worldwide from the Triassic period which lasted some 51 million years. By contrast, the new specimen comprises dozens of intact bones and teeth, along with an entire brain casing. The wings are in fact skin membranes largely held up by the fourth "finger", or digit, of their forelimbs. Huge sockets suggest C. hanseni had "fantastic eyesight", said Britt. When not soaring in search of a meal, it walked on all fours with its wings folded vertically. The fossil remains are still encased in sandstone, but scientists generated accurate 3-D images and models of each bone using CAT-scan technology. The site where C. hanseni was unearthed, known to fossil hunters as Saints & Sinners, reveals a dramatic story of survival and local extinction in the face of climate change, the researchers said. The rocks it was found in were part of an oasis in a two-million square kilometre (775,000 square mile) desert covered with giant sand dunes. "During droughts, large numbers of animals -- including pterosaurs, predatory dinosaurs and crocodylomorphs -- were drawn to the pond in the middle of the oasis, where they died as water dried up," said Britt. The result was a treasure trove of more than 18,000 bones and fragments from dozens of water-starved animals. C. hanseni is not the biggest pterosaur ever found, but was likely the largest of its era, especially for a desert environment. It also predates other desert-dwelling specimens by about 65 million years. Pterosaurs from the same period found so far came from ancient coastal areas in what is now Europe and Greenland. That the high-flying creatures were spread across much of the globe may have helped them survive the end-of-Triassic mass extinction, which wiped out half of the species on land and in the sea.